With some 8,000 space workers facing layoffs at the end of the shuttle program, groups in and around the Kennedy Space Center area are aligning to provide assistance and guidance to help those facing unemployment find new employment. Brevard Workforce Development was recently awarded a $15 million grant to help provide these highly-trained professionals find work in the post-shuttle era. Now the employment-assistance group is putting that money to work with the assistance of other organizations. The first of these events was held on June 17 at the Radisson Resort in Port Canaveral. Dubbed "Launch your Job Search" the fair was hosted by Brevard Workforce and the job placement website Monster.com. Services that were offered during this event included tips on interviewing, networking and how to improve one's resume. 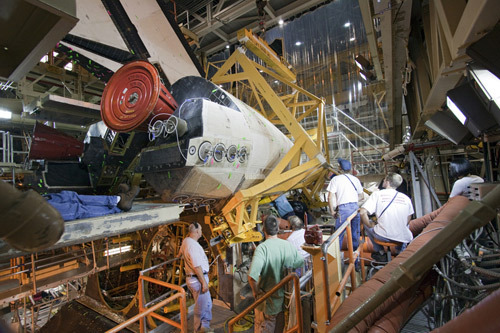 On June 24 and 25 Brevard Workforce, will team up with Kennedy Space Center to host a workshop to aid laid off or soon-to-be laid off workers find new employment. The first day of the fair will take place at two separate facilities located at Kennedy Space Center and will have over 40 different business and government organizations attending. This half of the job fair will only be open to current KSC employees. For those already impacted by layoffs there will be a second job fair held for them off of KSC. Held at the Radisson Resort at Port Canaveral the second day of activities will be open to both current and former shuttle workers. With the sheer volume of personnel expected to be affected when the shuttles stop flying a wide range of organizations are trying to reduce the impact of this problem. To participate in either of the job fairs it is required that individuals be registered with Brevard Workforce's Aerospace Workforce Transition program. On June 2, Secretary of Labor Hilda Solis visited the Kennedy Space Center Visitor Complex to announce that the $15 million National Emergency Grant (NEG) would be awarded to Brevard Workforce Development to aid the group in helping place former aerospace workers into new career fields. The funds are expected to be given to Brevard Workforce in July 2010. The NEG funds will provide greater numbers of support staff and training opportunities while allowing for continued delivery of services already offered. The NEG will also create more opportunities to train with local businesses from Brevard and other counties in the surrounding area. Most of these opportunities will be directed so as to eventually provide long-term employment for displaced workers. This is predicted to go a long way toward shoring up the expected losses in jobs in the region. There are currently only two shuttle flights remaining in the program with a third being debated between the White House and Congress. Even with an additional flight added to the program the last flight would take place in June of 2011, by the space shuttle Atlantis. With no large project like the Constellation Program to take its place many workers at NASA's Kennedy Space Center will need to find a new source of income.